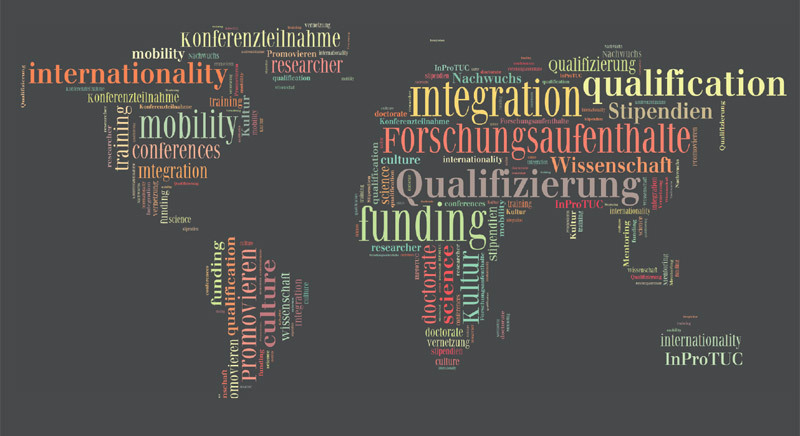 In it's development plan from 2013 the TU Chemnitz aims at the internationalisation of research and teaching. Therefor existing partnerships with other universities and research facilities are to be activated globally and new strategic partnerships are to be established. Furthermore, international research groups are to be formed and cross-border research projects are to be initiated and implemented. To realise these goals, InProTUC organises and funds preparatory missions for lecturers of the TU Chemnitz and preparatory meetings in Chemnitz with lecturers of potential partner institutions in terms of travel and stay expenses. With the aim to foster the internationalisation of Chemnitz University of Technology, preparatory missions of professors of TU Chemnitz to potential partners abroad are funded under InProTUC. In order to initiate cross-border research projects and exchange programmes or to develop common curricula professors can visit associated and potential partner institutions abroad. The deadline for applications ended on 4 October 2018. This year, a total of ten preparatory meetings is planned in order to further internationalise Chemnitz University of Technology. Until now, two scientists from Brazil and Tunisia visited TU Chemnitz. During these meetings, they got in contact with members and students of the faculties, the worked on joint project proposals and explored the possibility of an exchange of doctoral candidates. In the second half of the year, further visitors from Turkey, Mongolia, Spain, Russia, Norway, Austria and France are expected. In 2017, four preparatory missions of professors of TU Chemnitz to potential partners abroad were funded under InProTUC. In order to initiate cross-border research projects and exchange programmes or to develop common curricula professors visited associated and potential partner institutions in the Netherlands, the US, Italy and Russia. In 2016, six preparatory meetings between professors of TU Chemnitz and visiting scientists from Italy, Thailand, India, Chile, Norway and the US were funded under InProTUC. During those meetings, the visiting scholars got to know TU Chemnitz and the different fields of research. Numerous scientific discussions were organised. Common project proposals as well as joint publications were prepared and the institutionalised exchange between the partners was initiated. In 2015, five preparatory missions where organised and funded by InProTUC. Countries of destination were South Korea, Croatia, Austria, France and the USA. TU Chemnitz also took part in a fair tour to Canada. On these trips, research projects between the TU Chemnitz and potential partner institutions were lead on, a summer school with the participation of TU Chemnitz students was planned and joint publications were prepared. The TU Chemnitz was presented with its different research emphasis on site (especially in France and Canada) and matchmaking event for doctoral students and those interested in starting a PhD took place.